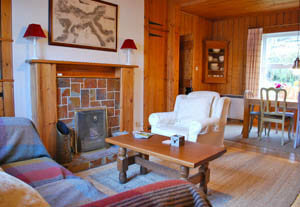 Skipper's Cottage is located in the welcoming village of Glenelg in an area of natural, outstanding beauty. It was originally built as a home for the skipper of a local landowner's yacht and is situated a mere 25 metres from the shore of the Sound of Sleat with magnificent views to the Isle of Skye. It is a walkers' paradise with coastal, hill and river walks from the front door and more challenging munroes a short distance away. There are endless possibilities for birdwatching, seal and otter spotting, kayaking and sailing. Visit the ruins of the enigmatic iron age brochs in tranquil Glen Beag or the more austere ruins of Hanoverian barracks that give a glimpse into the history of Glenelg. 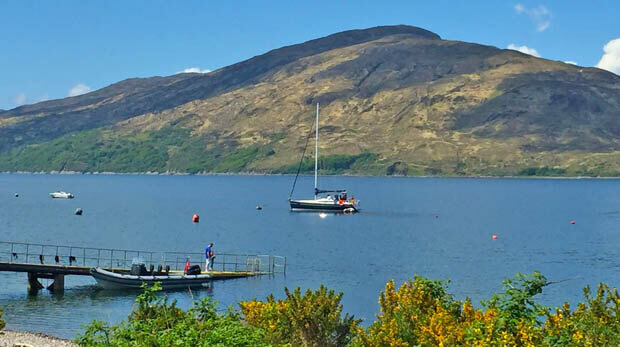 Hop across to Skye on the Glenelg ferry, one of the oldest of its kind, a five minute crossing through the swirling waters and perhaps spot a sea eagle or porpoises en route to exploring the many attractions of the island. Skipper's Cottage is just five minutes' walk from the village shop, the cafe in the community hall and the Glenelg Inn, renowned for its excellent sea food and convivial bar with lively music sessions and banter. Skippers is a perfect place to relax and unwind in the peaceful setting with its stunning views and ever changing light. Inspirational for artists and photographers alike. And Glenelg is even twinned with Mars! Skipper's Cottage was built to house the captain of the yacht of the local landowner and is located on the shore just opposite the pier at Glenelg. 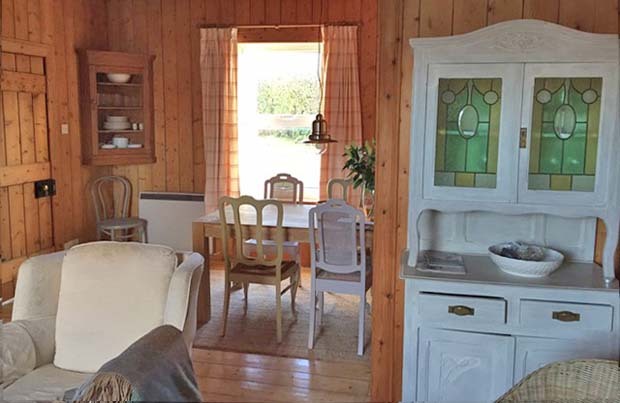 The cottage has recently been renovated to a high standard whilst maintaining a warm and cosy atmosphere with the original wood panelled walls, varnished floors and open fireplace. 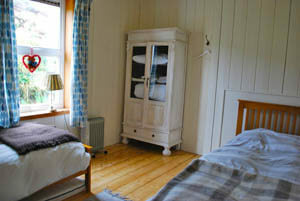 The cottage is accessed through the front hallway which has a coat rack and an old traditional pull up clothes dryer. 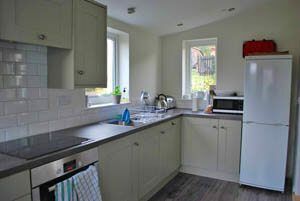 The kitchen is fully equipped and includes a dishwasher, washing machine and microwave. The living room is cosy and warm with a coal fire, sofa, TV and the dining table. 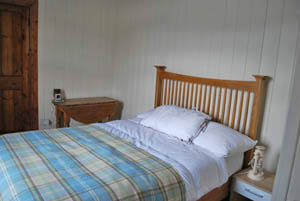 There are two bedrooms: the front bedroom has a double bed and a sea view, the second bedroom, with twin beds, looks out over the garden towards the mountains. The bathroom is panelled in white wood and includes a shower. Outside, the garden is slightly sloping, with its own private burn running into the sea - it adds to the charm and atmosphere but please be careful. There is garden furniture and a barbeque available or you can have your own barbeque on the beach at sunset in front of the house. Electric heating is included along with coal and kindling for the fire. Pets: 1 dog welcome, no extra charge. Weekend and short breaks available in winter, do ask. Discounts for longer stays upon request. 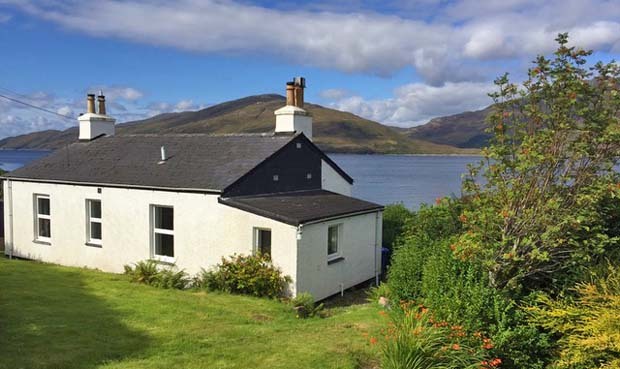 To book this charming cottage with wonderful sea views in Glenelg click the enquiry button below and see availability and rental prices. This pretty cottage by the sea is set in an enviable position looking over the Sound of Sleat to Skye. A Glenelg holiday offers amazing walking, bird watching, wildlife spotting, archealogical sites, trips on the ferry to Skye and with the bonus of a shop and fabulous inn within walking distance!